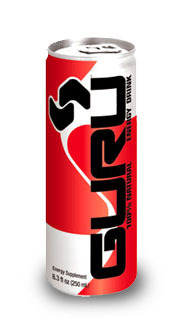 Guru is a lightly carbonated energy drink made with fruit juices, and no preservatives, taurine, or artificial ingredients. Guru was conceived for health-conscious lifestyles and is marketed as an energy supplement "designed for health-conscious minds that need to perform, to help deliver the mental and physical boost you need in the afternoon, at work, while studying, driving, before sports, or during times of stress or fatigue". Made from all-natural ingredients, GURU is formulated with an active botanical complex made from guarana, panax ginseng, ginkgo biloba and echinacea. The makers claim that GURU's unique proprietary blend helps increase alertness and vitality, stimulate concentration and memory, and enhance physical stamina. The GURU Lite version is sweetened with cane and luo han guo juice concentrates.